Last year the House of Blues at Downtown Disney closed after 15 years leaving a hole in the Orange County music scene. For me the location was memorable as the first venue I attended a Jamie Cullen concert. Have you heard of him? He’s not that popular in America for some oddball reason. He sings a rousing blend of jazz and pop and is an incredible live performer. If you ever get a change to see him – do it. And hopefully he’ll come back to the House of Blues because it’s reopening today in it’s new location at Anaheim GardenWalk. 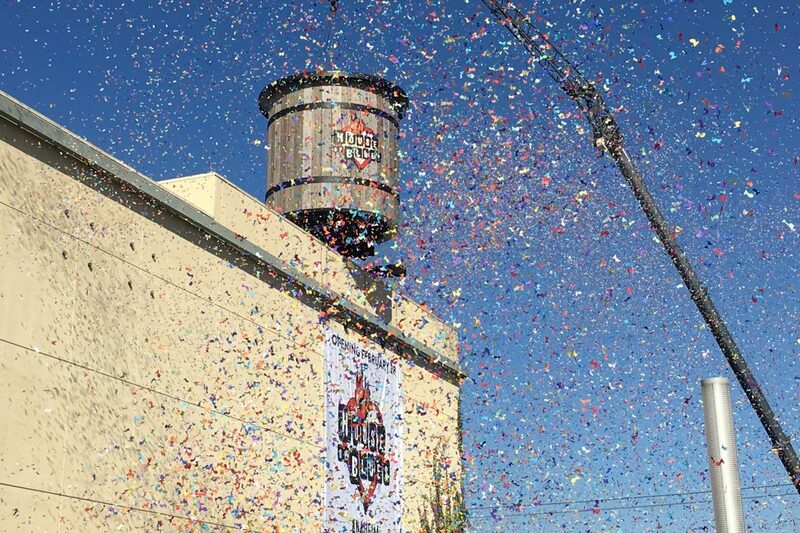 About a month ago I attended a preview of the new venue and viewed the installation of the brand’s famed water tower.With much ado it was placed on top of the structure to celebrate the venue’s return to Anaheim. Located at the far end of the center, in the former UltraLuxe Cinemas location, it’s a completely redesigned structure that will serve as the flagship location of the famed company. I was able to tour the building and, though it was early in its construction, was able to get a glimpse of all the amenities it has. There are multiple performance stages, various bars, a full service restaurant and the famed Foundation Room. With this new location there will be every opportunity to hear live music from local artists to world famous acts like Common and Santana. And every Sunday will be the Gospel Brunch featuring a full buffet and world class performances to start your Sunday right. Speaking of the food I was able to try a few bites of the restaurant’s menu. I was particularly fond of the Fried Chicken Sandwich topped with pimento cheese, coleslaw, and house-made pickles. It was a tasty entree that fit perfectly with the location’s Southern vibe. I’m glad the House of Blues has returned to Anaheim and have my eye on its calendar to see what shows I want to check out. I wonder if tickets are still available for Death Cab for Cutie?